Evolution and Revolution by Dior. How Dior Style Became Iconic. Dior is one of the mega brands of modern age. Over the past 50 years brand went through smooth evolution, created revolution in fashion and even got itself covered in scandals, boosting the media attention to the brand to a new level. Christian Dior, the originator of the brand, worked very hard entire life. Only in the past decade of his life he was able to show off his talent and create a blueprint in a fashion industry. He was known to be a humble boy from a noble family. His mother was of very strong character and made his career choice difficult. His family owned a fertilizer factory and was quite wealthy until business failed and they went to near poverty. Whoever thinks that making a career is hard today, didn’t really thought how it was for people then. But these stubborn, old fashion times actually allowed Christian Dior create an iconic “New Look”. Christian Dior truly revolutionized fashion and actually created the phenomenon of fashion. He became very famous when he cut the skirt making it just a right length to show off the shoes and beautiful woman ankle. This move in itself gave boost to shoes fashion, as shoes became much more visible under such skirt. 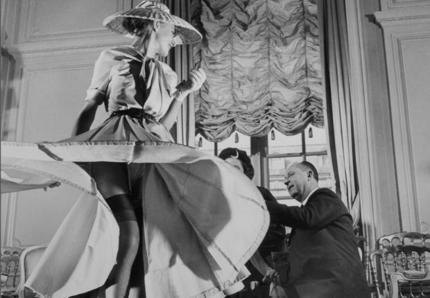 Christian Dior adored working with silhouettes. Fabric during World War 2 was scare and given little choices, Christian Dior creatively made new silhouettes to emphasize woman fragility and femininity. He once said “I created a flower woman”, meaning that the entire look from head to toe resembled a flower. He was big on accessories, and specifically preferred to use real jewelry and gemstones as oppose the replicas. Accessorizing the simple silhouette was another way to make a woman more attractive and her look finished. He was also a big fan of glasses. In fact Dior glasses were the first fashion eyewear accessories. He experimented with materials and shapes and bought out rights on Optyl – specially created plastic material that is widely used today in glasses manufacturing. Just before Christian Dior passed away, Yves Saint Laurent was hired by then well established fashion house. He came just in time to work with the iconic designer side by side. Since Yves Saint Laurent was only 18 years old when he started, he embraced Dior fashion and continued perfecting the New Look. He kept working with silhouettes, shaping woman’s body line and designing new accessories before leaving to create his own brand. Among the most recent and most memorable designers at Dior was John Galliano. He spent close to 20 years perfecting the brand and bringing it to the modern age. Galliano’s biggest contribution to the brand was that he kept it very famine. Despite new trends of trousers, jeans and minimalism, Dior brand kept it’s mark high concentrating on florals, details, beautiful female figure and colorful accessories. It was very unfortunate that John Galliano was fired a few years ago for a verbal fight in a bar. Since the Dior brand is a business where public image is everything, there was no place for a lead designer accused of antisemitism and alcohol dependence. Today, Raf Simons is a lead designer of Dior house. His first collection gained negative reviews as he tried to divert the Dior style towards manly and simplistic making all figures grey and dull. He quickly corrected himself this year creating a hit collection based on Flower Woman idea and putting more emphasis on accessories. 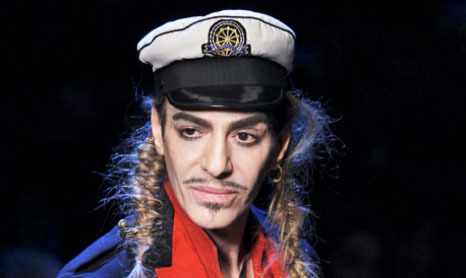 Yesterday Paris court has issued a guilty verdict on John Galliano. The punishment, as expected is rather symbolic – 6000 euro. John Galliano now is officially convicted by court in a hate crime and will bear a criminal record for the rest of his life. The loudest fashion scandal of 2011 is now over. It began in late February of this year, when John Galliano has been arrested for anti-Semitic accusations spoken while drunk in Paris bar in the midst of Paris Fashion Week. The arrest would not have been so unusual if not Galliano had been fired by the House of Dior, subsidiary of LVMH the following night. The act followed by the video leak where John is taped in a drunk state yet in another bar where he clearly favours Hitler. Galliano’s black stripe of events continued with him being removed as a lead designer from “John Galliano” fashion brand, also owned by LVMH as part of Dior suite. The one day trial took place on June 22 where the details of the event were discussed including detailed analysis of Galliano’s childhood, early years as designer, his private life and his recent career. John Galliano scandal is one of the loudest in the fashion history and the most covered by press in the history of modern media. The amateur video that became a grand evidence of true Galliano’s beliefs has been watched over 1 million times. There is no fashion magazine or blog that didn’t cover the event as it progressed over the course of past 7 months. While there are few popular fashion figures such as top model Kate Moss and Voque Editor Anna Wintour, who came to defence and support the disreputable designer, the shade of shame will be hanging over his name for a while. By most part this is because he has yet to admit his wrongdoing, to apologize or to demonstrate sorrow for the things he said on public about Asians and Jews. One would think that logical way to rebuild reputation is to spend time with related charities, accept interview invites or do at least something. Until any of this happens, John Galliano page in now part of history in fashion world. 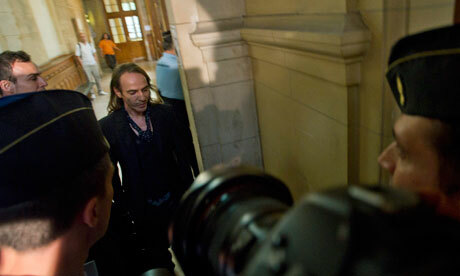 John Galliano trial was held yesterday, June 22 in Paris. Following the incident in the Paris café on February 28, 2011 after which flamboyant designer has been arrested he was accused for anti-Semitism and racism. John was also fired by house of Dior the next day after the arrest. To date, John Galliano scandal is the loudest in the history of fashion. First reports regarding the pace of the trial has appeared in press. John appeared in court with the team of his lawyers and an interpreter. It was reported that he was dressed in rather reserved outfit if compared to his usual wear, however one could still say this was a man of fashion and art by his tie over the bare skin and long hair. All witnesses spoke out in details describing Galliano behaviour and singling out offensive words he said under the influence of alcohol. What exactly he said, please read and watch here. Galliano was given time to speak out his testimony. To our biggest surprise, all his testimony was directed towards turning jury into pity. He talked about his story with alcohol that began in 2007 and turned into addiction after tragic death of his best friend Steven Robinson. He testified that he is battling a “triple addition” to alcohol, Valium and sleeping pills. After a decade of his Dior tenure Galliano faced an immense pressure from corporation to not only produce several collections a year for both Dior and John Galliano label, but also promote it actively in the wake of financial crisis. In fact the pressure was so high that following his father death in 2005 he had to go back to work straight from the crematorium. His scandalistic behaviour in public places was not rare and knowing that he is famous, basically iconic figure, he was often provoked to say things he didn’t really mean. It is an undeniable fact that his love of Hitler came out in such public encounters with strangers several times. There are testimonies from direct plaintiffs and there is a video confirming the fact. His lawyer Aurélien Hamelle argued that the video should be left out as evidence as Galliano spoke quietly and it should not be considered “public” speech. The biggest surprise in all this trial is the lawyer team took defensive approach. Galliano has never apologized and now when lawyers are arguing against the video it is clear that apology will not come during the trial. If only Galliano would do what other celebrities did in similar cases, the whole trial would not be as public. If convicted all he will be facing is maximum $30,000 fine and six months in prison. Prison term is unlikely. In a course of this defensive approach Galliano lost his job at Dior, was cut from the creative team of his own John Galliano label, faced the most negative press coverage by all national publications and even fashion press. All of this could have been minimized by a simple, public apology. Is it a matter of principle or a matter of a few thousand dollar fine? Is it worth a career? The verdict is to be decided by September 8, 2011.